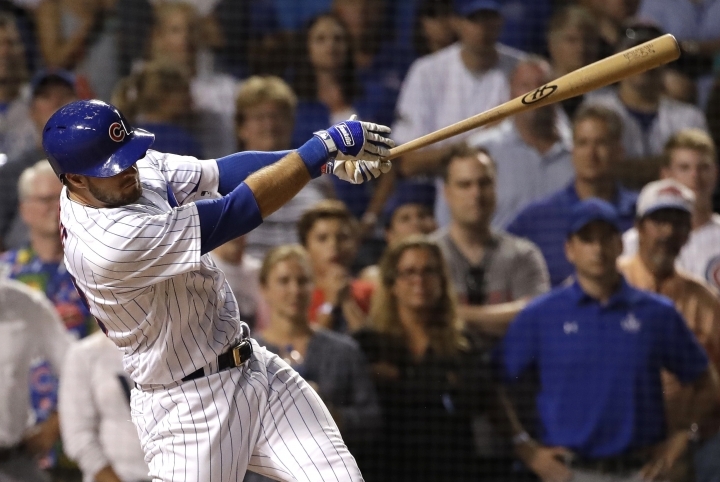 CHICAGO — Pinch-hitter David Bote smashed a grand slam against Ryan Madson with two outs in the ninth inning to lift the Chicago Cubs to a 4-3 victory over the Washington Nationals on Sunday night. Madson (2-5) came in with a 3-0 lead to start the ninth and quickly ran into trouble. He gave up an infield single to Jason Heyward with one out and hit Albert Almora with a pitch. Madson then retired Kyle Schwarber on a foul pop before hitting Contreras to load the bases, but Bote drove a 2-2 pitch well beyond the center-field wall. 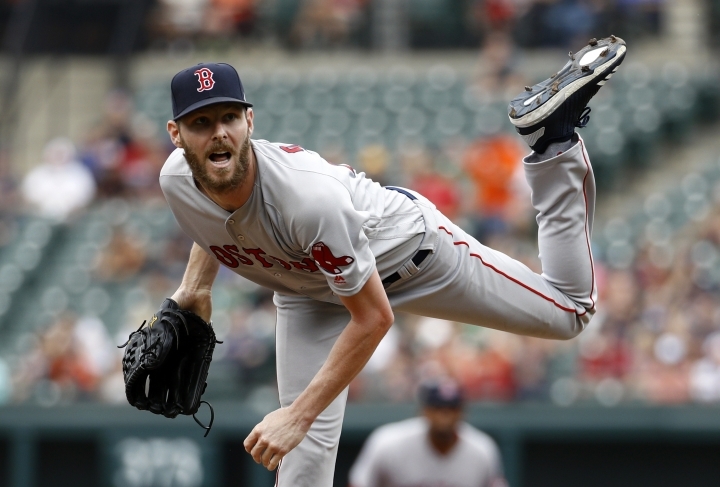 BALTIMORE — Chris Sale celebrated his return from the disabled list by striking out 12 over five dominant innings, and the Boston Red Sox moved 50 games over .500 by completing a sweep of the lowly Orioles. DENVER — Chris Iannetta drew a bases-loaded walk with two out in the ninth inning, and the Rockies beat the Dodgers after squandering a late lead. McMahon was walked intentionally to load the bases for Iannetta, who drew a five-pitch walk off Dylan Floro (4-3). The loss dropped the Dodgers out of a first-place tie with Arizona in the NL West. Wade Davis (2-6) pitched a shaky ninth for the win after Colorado failed to protect a 3-0 lead. NEW YORK — CC Sabathia threw six shutout innings, Giancarlo Stanton homered again and the Yankees won for the sixth time in seven games. Didi Gregorius also homered and turned in a nifty defensive play for New York. Sabathia (7-4) allowed one hit in his first win since July 4. Joey Gallo had two hits for Texas, which dropped three of four in the series. He also reached over the left-field wall to take a home run away from Austin Romine in the eighth. Stanton hit his 30th homer, giving New York a first-inning lead for the second straight day by connecting off Martin Perez (2-5). The slugger has five homers in his last six games. ANAHEIM, Calif. — Jed Lowrie homered and moved over 1,000 hits for his career, and Oakland held on for its ninth win in 11 games. The A's, who currently occupy the second AL wild-card spot, moved within 2 1/2 games of first-place Houston in the AL West. Fernando Rodney (4-2) pitched a scoreless inning for his first victory with Oakland. Blake Treinen struck out the side in the ninth for his 30th save. Angels manager Mike Scioscia went with a bullpen day. Taylor Cole (0-3), making his first career start, allowed three runs in 1 1/3 innings. SAN DIEGO — Freddy Galvis hit a grand slam for San Diego, and Travis Jankowski stole four bases and scored three times. Galvis connected against Jake Arrieta (9-7) in the third inning, hitting a two-out drive to center for his first career slam. It was his third homer in his last seven games and No. 8 on the season. Carlos Carrasco struck out nine in seven innings, and the Indians held on for the win. Carrasco (14-6) allowed three hits. Melky Cabrera hit a three-run homer against one of his former teams, helping the Indians take two of three in the series. SAN FRANCISCO — San Francisco's Dereck Rodriguez pitched seven innings of two-hit ball, continuing his sparkling rookie season. Rodriguez (6-1) allowed one run, struck out four and walked one. Will Smith pitched the ninth for his eighth save. Nick Hundley and Joe Panik each drove in two runs for the Giants, and Gorkys Hernandez scored twice. Starling Marte had a two-run double for the Pirates. Joe Musgrove (4-7) allowed three earned runs in six innings. MIAMI — Jose Reyes hit a two-run homer and Noah Syndergaard struck out seven in seven innings, leading the Mets to the victory. Michael Conforto also connected for New York, which took two of three in the weekend series. Wilmer Flores knocked in a run with a sacrifice fly. Bryan Holaday had two hits and drove in two runs for Miami. Wei-Yin Chen (4-9) allowed four runs, two earned, and four hits in six innings.